Planning your campervan layout will have a huge impact on your comfort, level of storage and ability to move around. Without a doubt, the type of van you own has the biggest impact on what you can accomplish with your space. If you already have a van, a big part of the equation has already been determined. Do you need a van you can stand in? Before planning your layout, think about what you intend to do with your vehicle. For example, if you’re planning on working while camping, then having a comfortable desk may be a high priority. Are you doing a lot of boondocking? Then you may need extra room for water and potentially a toilet or shower. Take some time to look at other builds to get an idea of what you might like. 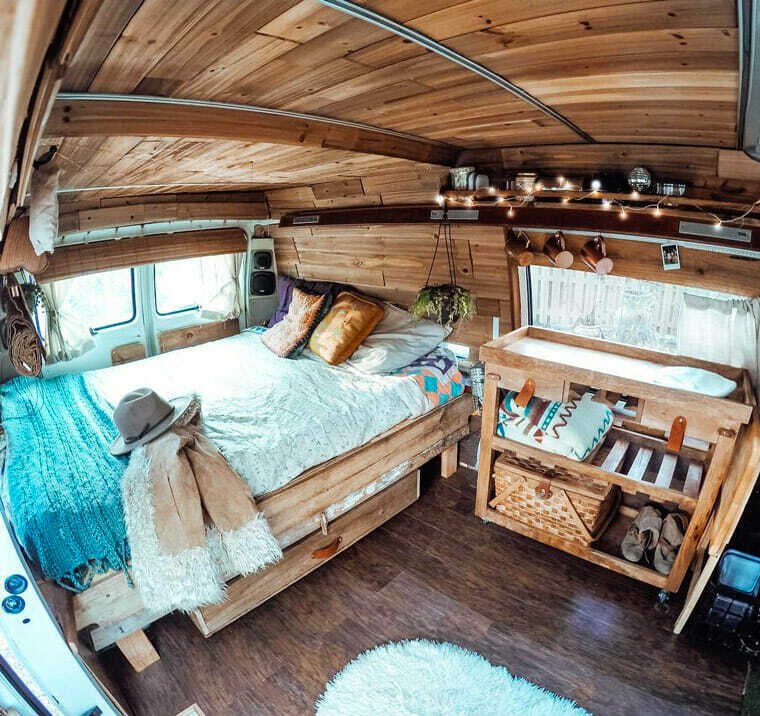 Instagram and Youtube are great sources of inspiration for building a van. Remember: there is no right way to build a van. Just because someone built something creative does not mean it’s functional, or even practical for full-time living. Moreover, don’t be disillusioned by high-end builds. 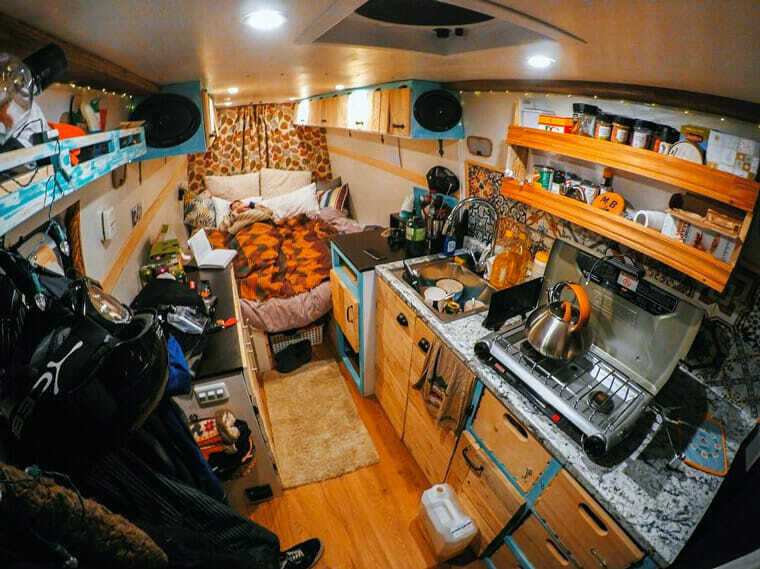 You don’t need to spend $50k to live comfortably in a van. You won’t get everything perfect on the first try, but you can get a good head-start on your lifestyle by taking the van out on a dry run. Sleep in it as you plan on doing during vanlife for a few nights (in the city or in a campsite). You can quickly realize that your real-world priorities are different than you had imagined. Will there be a toilet in the van? Are you planning to hook up a sink? How much water storage do you plan to bring? Will you mainly be cooking inside/outside or both? Do you need propane storage and ventilation? How much storage space do you need for clothes/personal items? Mountain bikes, skis, surf boards ect. One thing people often forget about is garbage and dirty laundry. A bag full of dirty clothes ends up taking a large amount of space. We also highly recommend having some sort of seating in mind where you can sit with your back fully upright. Whether that means swivel seats – or bringing along a portable camping chair that can be set up outside – do not underestimate comfortable seating! Once you have your van, it’s time to take some rough measurements. It’s often easier to measure the van yourself than to search online for dimensions of your specific model. A Mercedes sprinter for example has widely different dimensions for varying lengths, wheel bases and heights. This gets even more complicated with different years. Remember that your measurements are rough estimates and not meant to be exact. Vehicles are not square boxes and some have significant curves in them. If you’re measuring an empty vehicle, keep in mind that adding insulation is going to reduce your footprint by up to 2” per side! Start with a piece of graph paper and draw out the floor of your vehicle. It doesn’t have to be exact but you do want to get the proportions as close as possible. Mark where any doors or windows are in the van. Chances are, your bed and mattress are going to take up the largest amount of space so it’s one of the more important things to get right. Here are common mattress dimensions. Aside from that: electrical, gas and plumbing placement is equally important. You want to arrange propane tanks near a door (or have a vent to the outside) for safety purposes. Pro tip: Storing propane tanks outside the vehicle on a cargo hitch or horizontally underneath the vehicle chassis is a great way to save space! Electrical components like batteries, charge controllers and inverters should not be located next to any fuel tanks. The inverter should be within reach so you can turn it off when you’re not using it to save power (unless you have a remote). A 12v refrigerator should have at least 1-2” of space around the vent area to improve efficiency. Have at least one water jug accessible from inside the vehicle. If you’re not going stealth, take advantage of trailer hitches and roof racks. A vent fan should be located far away from a window opening so you can get the best airflow. Try to combine as many objects as possible. A bed can double as a couch or seating for a desk. A toilet can be built into a chair, or a trash bin can be hidden beneath seating. Read our post on storage and organization hacks so inspire yourself with some cool storage ideas. One thing many people forget to take into account when designing their build is weight distribution. Try to spread the weight as evenly as possible throughout the build. This will give you the best gas mileage and keep your tires from wearing out on one side. This is also important when choosing materials for your build. You don’t want to exceed your gross vehicle weight limit because it could result in costly repairs in the future. Modeling your vehicle with a 3D program can give you a new perspective of how it might look from other angles. While this is certainly not a necessary step, if you want to build a model of your van one of the most popular tools people use is SketchUp. SketchUp is a free program and quite robust. It does take a bit of learning, but it’s one of the easier 3D programs to manage. Below is a tutorial showing how to design a van with SketchUp. Once you think you’ve found a layout you like, the next step is testing it out. Grab a roll of inexpensive painters tape and mark out the large objects on the floor or walls of your van. You may be surprised by how much (or how little) space you have to move around. Some people go as far as building cardboard templates of their cupboards and seating to get a better idea of how to design their build. Be open to scrapping your design and starting again. Below we’ve included a variety of campervan interior layouts to get your brainwaves flowing. Hopefully these ideas can help you plan your build! This is the interior of a 1988 Chevy G20 Sportvan. Built out by @the_wayward_blonde it has a cool rustic vibe that we love. The ceiling is built out of reclaimed cedar which are lightweight and gave a unique color. All of the door panels and shelving were built out of recycled fence posts and it’s topped off with lavender candles and fairy lights! 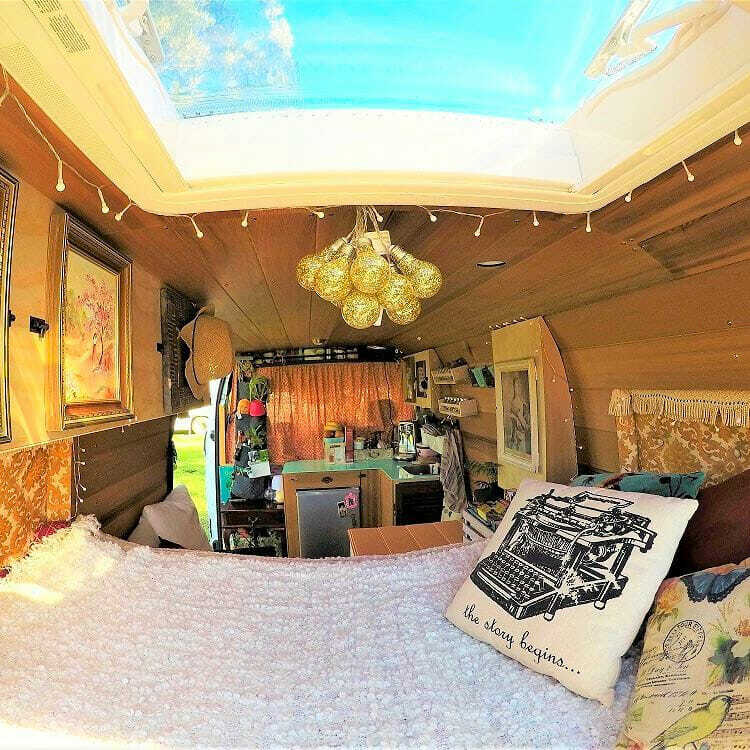 The skylight is what drew us to this build by @glampervanlucy which has a nice layout with a separate kitchen and bed area. The van itself is a Renault Master from Australia and is decorated with a bohemian flair. 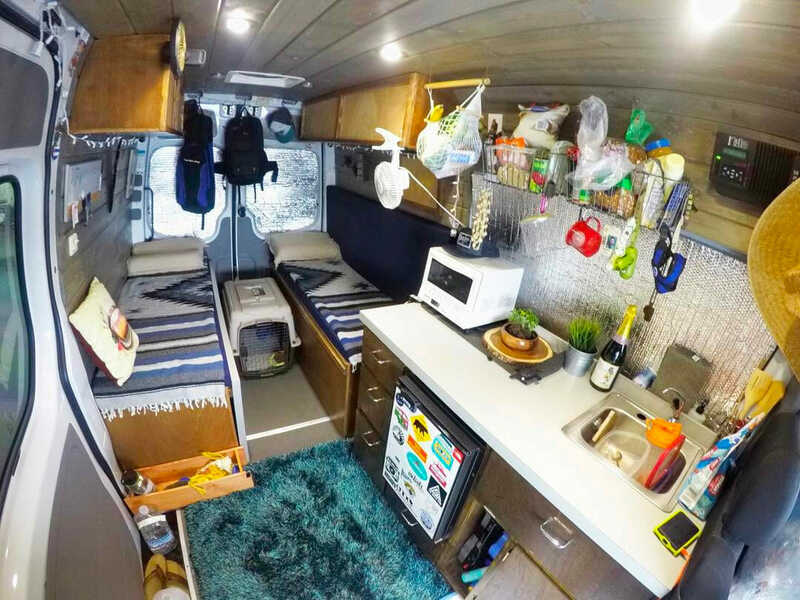 @vanlife904 made good use of space with his idea to create two single beds and still leave room for the dog! One of our favorite things about this build is the ability to add guests. The van is a 2016 Mercedes Sprinter and was built out with a functionality and layout in mind. A modern design by @van.there makes good use of space and leaves room for both a kitchen and a workspace. This travel couple built out a 2013 Mercedes Sprinter with cleanliness and organization in mind. We like that all of the surfaces are smooth and easy to clean. All of the drawers are something we admire and could certainly use in our next van build! @kayloor has a practical interior and one of the few we’ve seen with a hard separation between the back and the cab area. The two bench seats on the sides fold down into a full-sized bed but leave room for seating and working during the day. We like that by closing off the cab she can add an entire wall for the kitchen making even more space for countertops! Kayloor is from Spain and lives the van life in a 2000 Ford Transit. A simple van with a low ceiling, @heytess_ was able to make this Toyota HiAce look efficient and organized. We like that there are so many drawers for storage and everything can be tucked away during the drive. @dont_know_road was able to pack a whole house of stuff into this Sprinter. One of our favorite things about this layout is all of the short shelving above the doors and kitchen area. Those cubbies leave a lot of room for spices, ingredients and entertainment. This Sprinter van also looks extra long, allowing @dont_know_road to bring along anything he needs! @emreunal__ is a windsurfing instructor from the Ukraine. With just a single bed in campervan you get a lot of room for storage and cooking. What we like about this van is the built-in stovetop and upper shelving. I am looking into the van lifestyle and this was so amazingly helpful! Thank you!